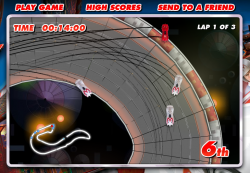 Use cursor keys to drive in this high-speed racing game. Hit spacebar to deploy your car’s weapon, and shift to launch into the air. Can you beat all the other players, which are recordings of other real human drivers? Ah, a chance to do a pure arcade racing game, with actual racing cars rather than trollies or reindeer or airport baggage karts! Brilliant. I was determined to make a really good Flash racing game, with arcade but partially realistic handling, fun tracks, weapons and a little bit of a multiplayer twist. AI in racing games is hard. Even the big name consold games don’t get it right, and have either unrealistically good AI drivers or comically bad ones. In a lot of games, the computer AI just bulldozes through your car sticking to its pre-programmed lines like a limpet. It feels unfair, and it’s not good enough! Rather than build a crappy AI for this game, I came up with the idea of recording people’s gameplay whilst they were racing and storing them on the server (stored by their starting position and overall performance). Then, when a new game is started, the server puts you in a random grid position and sends out 8 replays – one from each remaining grid slot. They are picked at random, but in a skewed way so that you play against a mix of the best, worst and mediocre players out there. That’s self-ballancing – the range of opponents you meet is determined by the actual range of skills out there, from good to bad. There is a par time over which your score isn’t recorded to avoid skewing the results towards people who just leave the game running forever, but other than that it’s a level playing field. This strategy really worked for this game, and everyone gets opponents who play roughly at their level – and some who are faster that they can work towards beating. The big problem with storing and serving replays is that there’s a lot of data. AS2 doesn’t handle binary data very well except in pre-given formats that are delt with internally like jpegs, sounds or SWFs. So, a replay consists of a great long string of car coordinates etc in a text format. There’s very little encoding, as I found that simply processing the raw strings was enough of a task for Flash, let alone processing an encoding on top of that. I’d have liked to have compressed the strings, or base-64 encoded them or similar, but it just wasn’t feasable. The remaining problem was that each play of the game required about a 1mb download of replay data from the server, which was very bad for bandwidth when the number of plays started to climb dramatically. We had to trim back the number of replays sent to the client to just 4, then 2, then none as the load increased. The URL presented here allows you to have all 8 opponents switched on, as it’s going to be pretty low-load from this website. Car handling was a major area of improvement in this game over previous racers I’ve built. The cars have a single giant virtual tyre that they run on, which resists sideways motion and promotes forwards motion. When the car turns, this virtual tyre turns with it, causing the car to grip and change direction. This is reasonably analogous to the way a real car turns in many ways, and leads to a decent feel. Rather than programming in effects like sliding if you turn too fast, or if you land a jump facing sideways to the direction of travel, it just naturally falls out of the physics model. Likewise, slow speed turning works better this way too. The model is also very tunable to different car styles, so some are fast but have little grip, some have too much grip and are hard to control, some are ballanced and so on. There is no ‘best’ car, although there tends to be a couple per track that people end up using predominantly over the others. A big part of the Speed Racer film was the twisting looping jumping corkscrewing tracks. In a 2D game you’re limited to how far you can recreate these effects, but the tracks certainly do have these stunts in them, which is a nice effect. Even better, you can short-cut them in cunning ways using your car’s jump ability, which adds a little depth. Another requirement from the film is the use of car-to-car weapons. This poses a problem with the replay technology, as a replay is by its nature an asynchronous event. It does not contain data saying how the human player reacted to being hit by a weapon at any random point. The simple rules I adopted were to never fire weapons at the human player (ie, weapon usage is not recorded in the replays), and if a replay car gets hit, to simply spin it around in a straight line along its direction of travel until it falls off the track edge. The other thing you can’t do with a replay is car-to-car collisions. You can’t purturb the replay car from its course, as that would put you ‘off’ the replay line with no obvious way to get back on it. You can’t just slow or collide the human player either, since that would get recorded in their replay and when played back to another player, would look strange as they randomly react to a collision that didn’t happen. There was nothing better I could think of than simply allowing cars to overlap. Not completely satisfying, but that’s all I could do. As cheating features quite heavily in the film races, I’ve deliberately allowed for it in the game. If you use your car’s jump facility carefully, there are a number of places you can take shortcuts by jumping sections of track. It’s risky of course – you stand a fair chance of falling off the track instead of saving time, but that’s good for ballance. There’s an issue with the pace of the game and some of the cars. If the player picks one of the faster cars, it’s hard to see what’s coming and to keep the car on the track whilst cornering. Falling off track is punishing to your time at least, but doesn’t throw you out of the race because it’s really rather easy to do. If you opt for a slower, more controllable car, you stand less chance of keeping up overall. Performance is vital in a game like this. Keeping the framerate high was always a priority, right from the beginning. There’s a huge amount of stuff bitmap-cached to aid this. The background is a short loop, scrolled around as required and flipped to the other side of the loop when needed. There are a few layers of it, but each is just a series of bitmap cached effects. The track itself is created from segments at the start of the game. The track exists as metadata in the code, as a simple array of segment IDs. The IDs are itterated as the track is created at the start, and each segment is instantiated into its own movieclip from an end-marker clip in the previous segment, then bitmap-cached. This allows for much bigger tracks, as it neatly gets round the 2880px bitmap limits by having lots of smaller ones instead. It does take a while to produce the track at the start though. This is what’s happening behind the silver “creating track” screen before the race. Without the bitmap caching, the length of time that screen appears for (several seconds on most machines) would happen to be the in-game framerate too! Generating the track in segments gives me a nice convenient way to tell how far through the track each car is. They are hit-tested against the segment they are in and the next one too, and their position is updated when they are in the ‘next’ segment. If they are over no piece of track, their position is hit-tested against all segments as they may be about to perform a shortcut jump. Whilst in the air however, they are considered to be on the piece of track they last touched. That’s where they get reset to if they crash, and where they are positioned in terms of the race order. Multiply up the bandwidth for a typical gameplay by a best-case number of plays to see if it’ll work with your hosting provision!